On his website, Spine Health, doctor of chiropractic John Schubbe recommends using a variety of pillows to get the comfort required for a good night's sleep. Dr. Schubbe also suggests that grain-filled pillows may offer much needed structural support to those suffering from spinal stenosis or spinal disc degeneration. Use almost any grain to fill a pillow, although some types of grain are more durable and hypo-allergenic than others. 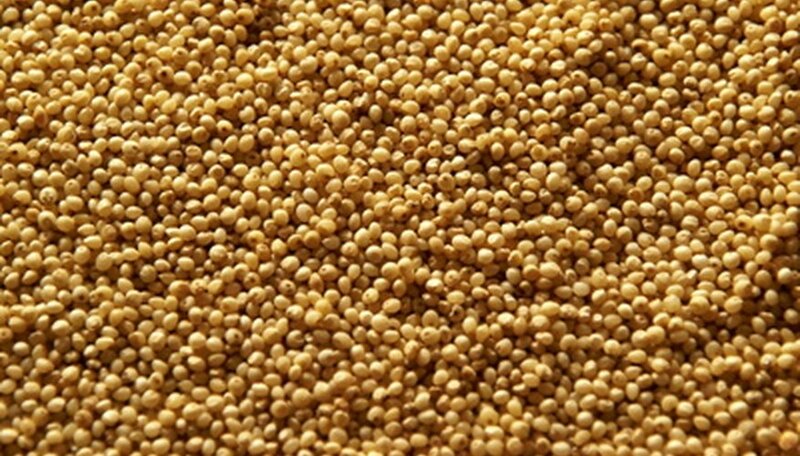 Millet is a nutritious, pest-resistant grain and is a staple food for many cultures around the world. In America, millet is more widely known as a grain for feeding birds and creating contouring pillows for relaxation and tension relief. As with many so-called "grain pillows," it is actually the hull of the millet grain that's used to fill pillows. Millet is sometimes combined with lavender or other herbs and essential oils to combine the comfort of a grain pillow with the beneficial effects of aromatherapy. Though not technically a grain, flax seed pillows are included in the general category of grain pillows because of their weight, texture and ability to contour around the body's shape. Flax seed pillows are favorites because you can heat them in the microwave and use them when moist heat is indicated. The natural oil content in flax seeds helps them maintain heat for a longer period than some other grains. Also chill them in the freezer, and apply them to sprains, sunburns or whenever a cold pack is needed. Buckwheat and buckwheat hulls are used to fill grain pillows. Because they are lighter, the hulls are typically used for larger, sleeping pillows and the grain itself is used for smaller pillows such as neck and eye pillows. Warm pillows made from buckwheat seeds in the microwave, and use them as hot packs: however, the Health Protection Branch of Health Canada warns against microwaving pillows filled with buckwheat hulls. At least one incidence of fire has been linked to a buckwheat hull pillow that was warmed in the microwave.